Heads of creamy white lace flowers appear in summer, leading to blue-black berries in autum. Perennial. H:6m W:spread 3m. 12cm, 17cm. • Pick flowers in spring, berries in autumn and fresh leaves throughout the year. • Dried flowers are made into tea. 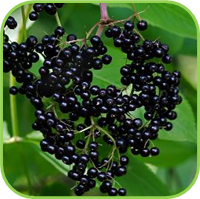 • Juice is boiled with sugar to make a cordial (elderberry rob), flavoured with ginger and cloves. 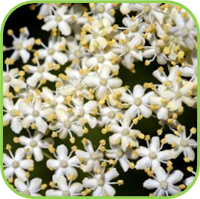 • Improve the complexion by splashing cold elderflower tea daily onto the face.It will also tone and soothe the skin. • Berries contain Vitamin C and Iron. • Juice of cooked berries: Headaches. • Flowers: Topical for irritated or inflamed skin. • A rich source of anthocyanins, a group of antioxidants that help protect the body against diseases. • Flowers and berries: Influenza, Colds, Catarrh, Sinusitis, and feverish illnesses. • Leaves and berries: diuretic. • Hot tea excites and stimulates. • 2-4 ml three times per day. 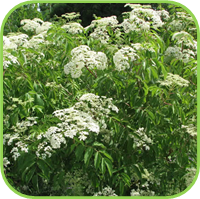 • Elder leaves are boiled and strained to make a natural insecticidal spray.